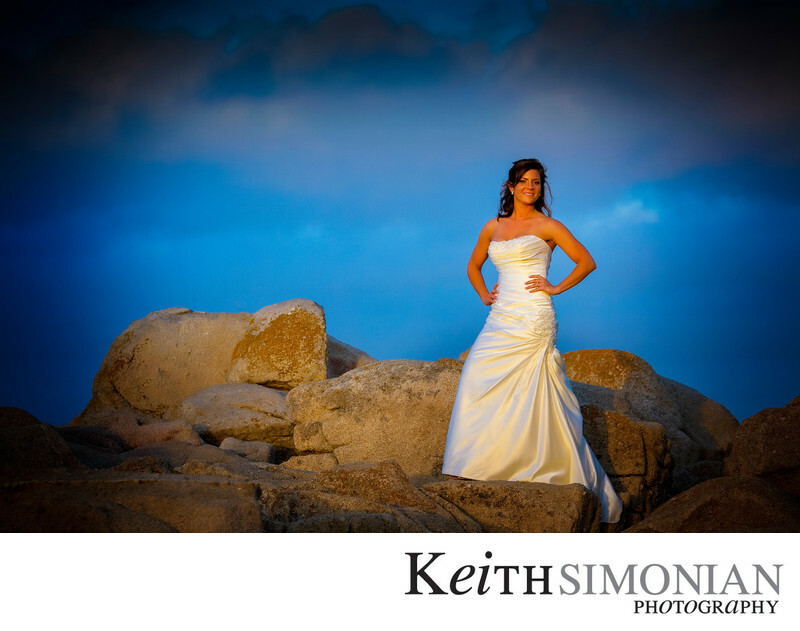 The Bride is illuminated by the late evening sunlight against the blue sky on the rocks at Lovers Point in Pacific Grove, California. The wedding took place at the San Carlos Cathedral in Monterey, and the wedding reception was held at Gatherings in Pacific Grove not far from Lovers Point. There comes a point in the late evening when you hope that bride and groom can spare a few moments for photos in what most times is the most beautiful light of the day. Fortunately, the couple was able to get away from the reception and catch the golden light of sunset. Location: Lovers Point Park 630 Ocean View Blvd Pacific Grove, CA. 1/400; f/5.6; ISO 320; 135.0 mm.